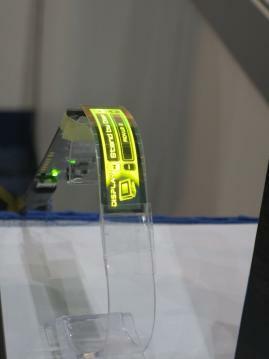 Kyulux and Wisechip unveiled a flexible PMOLED display that uses Kyulux’s Hyperfluoresence yellow emitter. Wisechip says that the power consumption of this display is almost half of Wisechip's regular fluorescent yellow PMOLED. The first flexible HF PMOLED is a 1.71″ 256x64 display, that is now ready to be produced (Wisechip says this will enter mass production before the end of 2018). 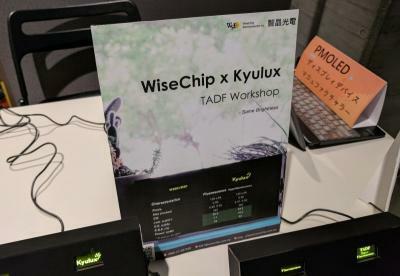 Wisechip originally aimed to introduce its first glass-based HF yellow emitter PMOLED by the end of 2017, but it seems they decided to jump straight to a flexible panel. Researchers from Taiwan's National Tsing Hua University (NTHU) developed a new TADF OLED emitter material that maintains its high efficiency at high luminance. The researchers say that this new material is the world's most efficient TADF emitter at high brightness. 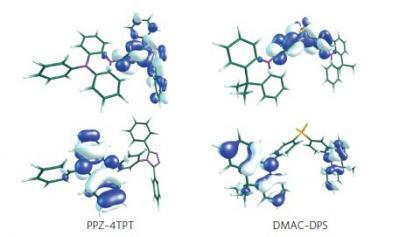 The new material is made from two diboron-based molecules, CzDBA and tBuCzDBA. These donor–acceptor–donor (D–A–D) type and rod-like compounds concurrently generate TADF with a photoluminescence quantum yield of ~100% and an 84% horizontal dipole ratio in the thin film. The researchers synthesized a green TADF emitter that achieved a a high external quantum efficiency of about 37.8% with an efficiency roll-off of only 0.3% at 1,000 cd/m2. 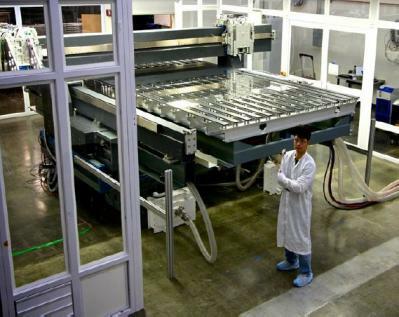 Display Supply Chain Consultants (DSCC) says that OLED material revenues grew 43% to reach $869 million in 2017. DSCC expects the OLED material market to grow at a 24% CAGR until 2022, when the market will reach $2.56 billion. 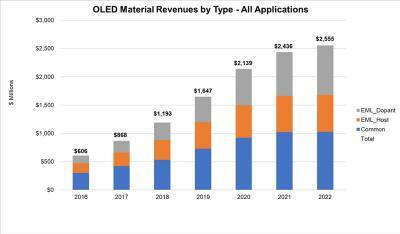 The small/medium display market accounts to about 59% of the total OLED material market, and this will continue until 2022. For the TV market, DSCC expects ink-jet printing to enable producers to make lower the material costs of OLED TV production, and OLED TV materials will grow at a rate of 23%, from $344 in 2017 to $963 million in 2022. 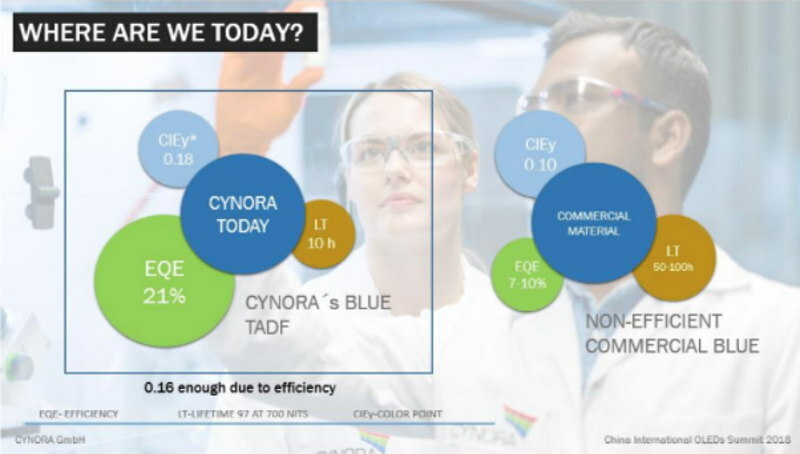 German TADF developer Cynora recently participated in the international OLED summit in China, and the company presented its latest blue TADF material that features a CIEy of 0.18, EQE of 21% and a lifetime of 10 hours LT97 at 700 nits. This is an improvement of the material shown in September 2017 (which had the same specification but with a lower EQE of 14%). Cynora reports that during the last 24 months, the company achieved its most important goals - high efficiency and a satisfying color point. It has made "tremendous progress" in the last year on the lifetime front and is now close to commercial lifetime specification. Many OLED producers believe that Ink-Jet printing of OLED emissive materials is the best way to achieve lower-cost OLED TV production, and to enable OLEDs to compete in the medium part of the TV market. Ink-Jet printing is an efficient process (less material waste compared to evaporation) and it can be very quick as well. The main drawbacks of inkjet are the limited resolution and the need for soluble emissive materials which are less efficient compared to evaporation ones. 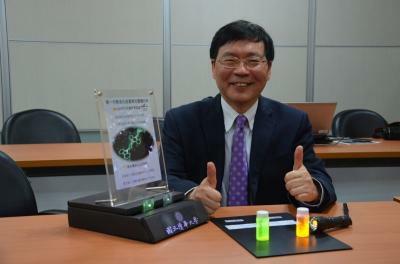 These challenges are being overcome, and it seems that at least four groups (in Korea, Japan and China) are charging forward towards mass production of ink-jet printed OLEDs. Ink-jet printer makers and soluble material suppliers are also optimistic ink-jet printing commercialization will soon be here as the material performance gap is diminishing.